It’s pretty obvious that butterflies and moths can see. They have large compound eyes on their head, as well as smaller light-sensitive ‘simple eyes’. Insects’ eyes are different to those of vertebrates, which have a single lens and a retina made up of thousands of light sensitive cells called ‘rods’ and ‘cones’. This works rather like a modern digital camera with a megapixel sensor. 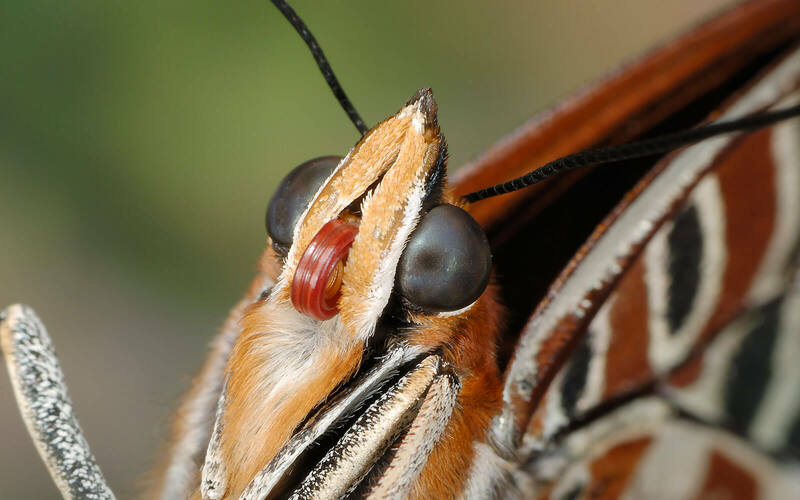 A compound eye, as shown on this Silver-barred Charaxes (Charaxes druceanus druceanus), has hundreds to tens of thousands of individual lenses, each focusing onto a single light sensing cell connected to the brain. For years, scientists thought that as a result, insects see a coarse, pixelated image of the world. Ultimately we can only guess at what they see, but recent research points to their brains being able to stitch the ‘pixels’ together to form a higher resolution image. 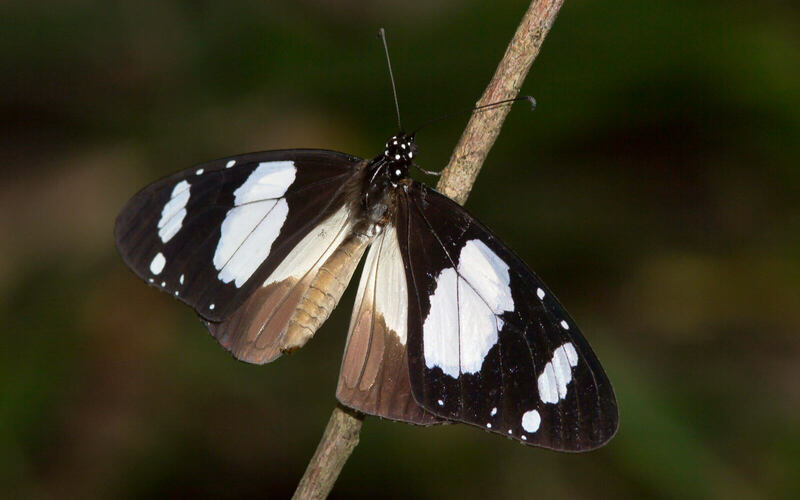 Many butterflies’ wing patterns often show sexual dimorphism, hinting that colour and pattern play a large role in mate recognition. 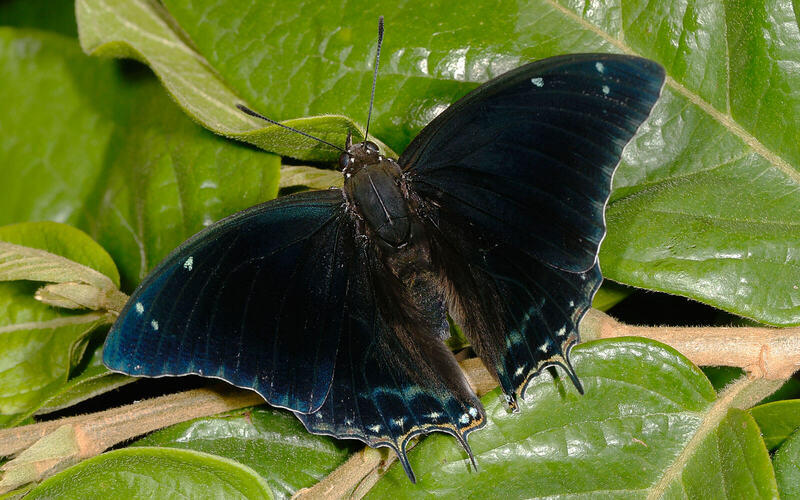 An example is the locally occurring, rare Karkloof Charaxes (Charaxes karkloof karkloof), with its sombre black male and brightly coloured female. We also know that some butterflies have colour vision, because some of them prefer red flowers. 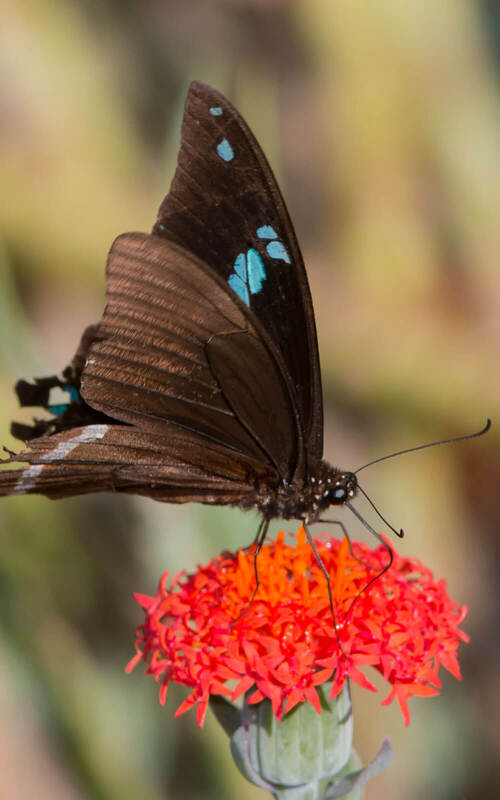 Swallowtails are well known for this – like this male Green-banded Swallowtail, (Papilio nireus lyaeus) on a Coral Senecio (Kleinia fulgens) flower. But what about their other senses? 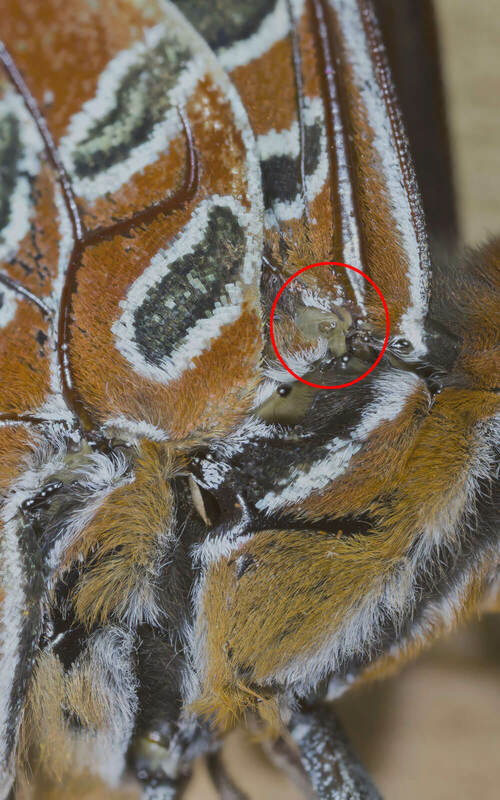 Smell and taste are important in butterfly and moth communication. As in humans, these two senses are closely related. ‘Smell’ is taken to mean detection of odours in the air, ‘taste’ detection by touch. There are many examples of both types of sense. Male Emperor (or Atlas) moths like the White-ringed Atlas (Epiphora mythimnia mythimnia) are known for their large, feathery antennae. Females, on the other hand, have thinner, filamentous antennae. 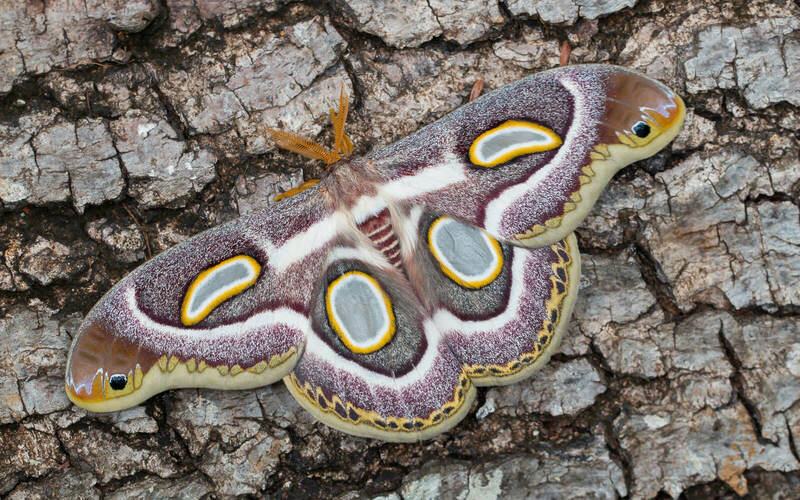 A female of this moth can sit on a wall and ‘call’ many males of the same species. She does this by releasing a pheromone – a potent mate-attraction chemical. Moths’ use of pheromones to attract mates is well known and the chemicals used by certain pest species have been synthesised. They are used to attract them in order to destroy them. 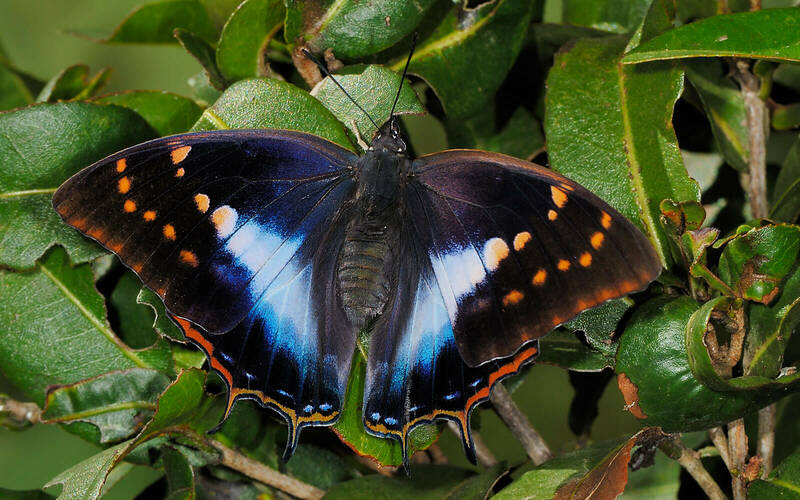 Many male butterflies use pheromones to attract females – or perhaps to warn off other males. Monarch, Friars etc (Danainae) like this Novice (Amauris ochlea ochlea) have patches of special scent-carrying wing scales, as do other groups of butterflies such as Swallowtails (Papilionidae), Browns and Ringlets (Satyrinae) and Sapphires (Theclinae). These scales are scattered over the female during courtship and induce her to allow mating to occur. 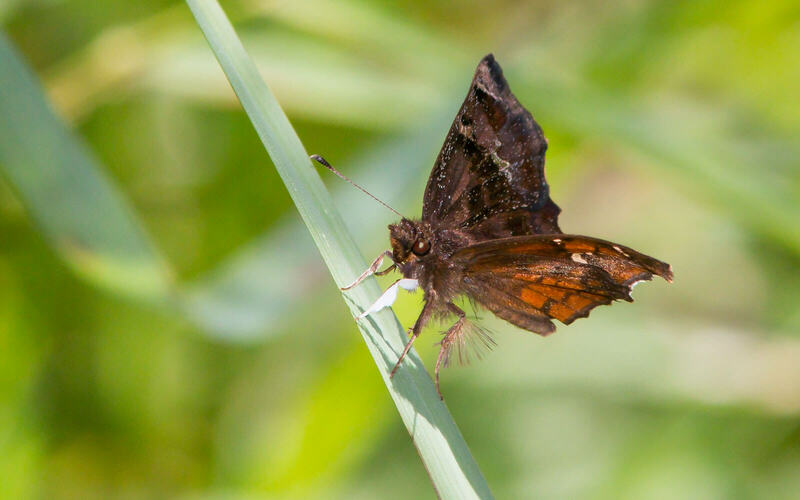 Male Skippers in the subfamily Pyrginae carry long hairs on their legs, that they expose when displaying on a prominent perch in their territory. This male Marbled Elf (Eretis djaelaelae), photographed near Gillitts Waterfall, is showing these hairs. His bright white legs (which the females also carry) may be a visual recognition cue. Skippers may be doing this to attract females – but it tends to be done on their territorial ‘lekking’ spots, so this may be done to deter other males. 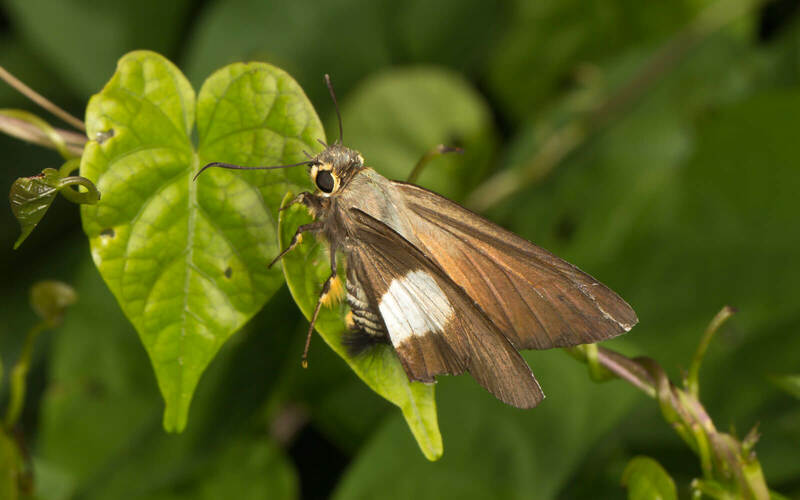 At least one large Skipper, the Striped Policeman (Coeliades forestan) has evolved scent-marking behaviour similar to a dog urinating on a lamp-post to mark his territory. The male has a large hairy tuft on his abdomen tip, that he touches onto leaves around his territory as he follows a ‘beat’ around it – hence the name ‘Policeman’. This female Layman (Amauris albimaculata albimaculata) has ascertained that this Tylophora anomala plant will be acceptable to her larvae by touching it with her antennae and feet. 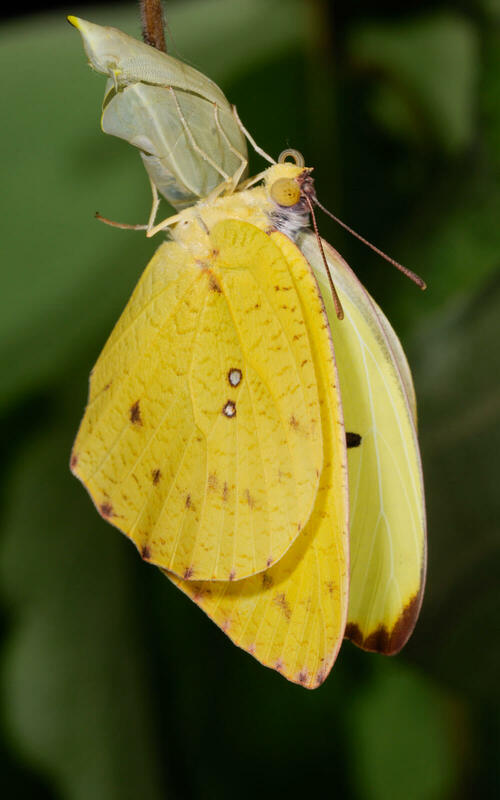 Butterflies and moths have many scent receptors, taste organs etc on various parts of their bodies. 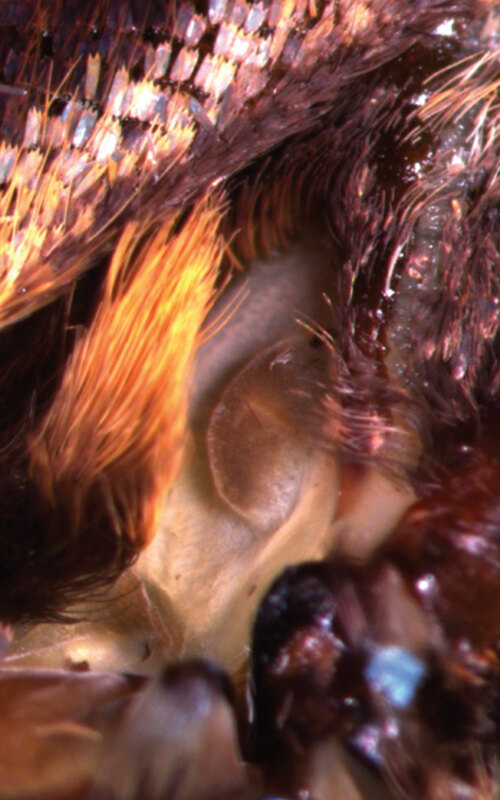 The antennae, feet, and the labial palpi either side of the head all carry scent receptors. Some are used in sexual signalling, but others are used by females to choose the right plant to lay her eggs on. Most butterflies and moths are limited in their host plant options, and they use their senses of smell and taste to help them find the right plant. 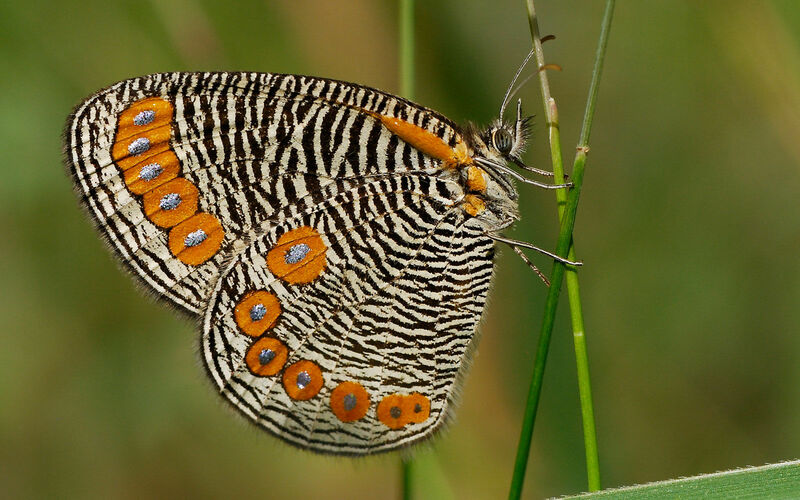 It gets even weirder with the so-called Gossamer-winged butterflies in the family Lycaenidae. Many species’ larvae live with ants, and they survive, nay thrive, in that environment by taking advantage of the ants’ use of a range of pheromones to communicate. The larvae are able to fool the ants into seeing them as their own brood – allowing them to live inside their nests and in many cases, eat the ants’ own young. 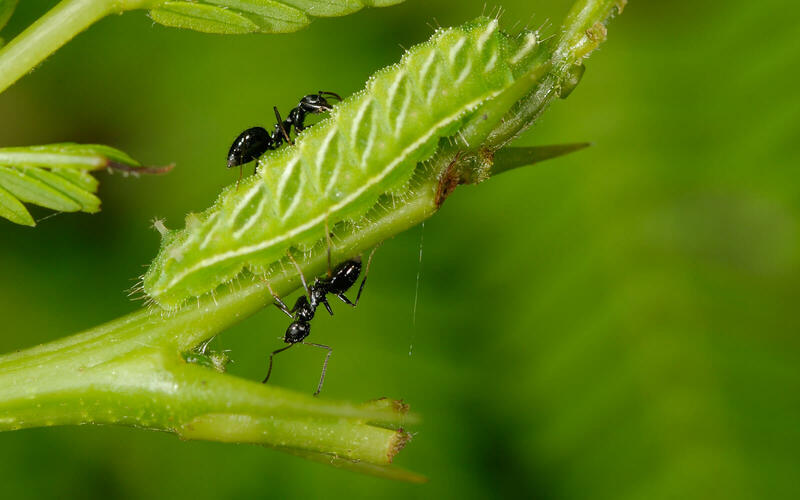 Some only go as far as attracting ants to them as they feed on a plant – the ants then deterring the small wasps or flies that prey on the caterpillars. Recent scientific evidence shows that the caterpillars can modify the ants’ behaviour by using these pheromones. You can watch the caterpillars pumping this ‘scent’ at the ants from special glands on their bodies. This Black-striped Hairtail larva (Anthene amarah amarah) is doing this in the photo – the tiny organs on the larva’s tail (to the left) are emitting ant pheromones. After reading the above it’s probably no surprise to learn that many butterflies and moths use sound to communicate – or hearing to protect themselves. 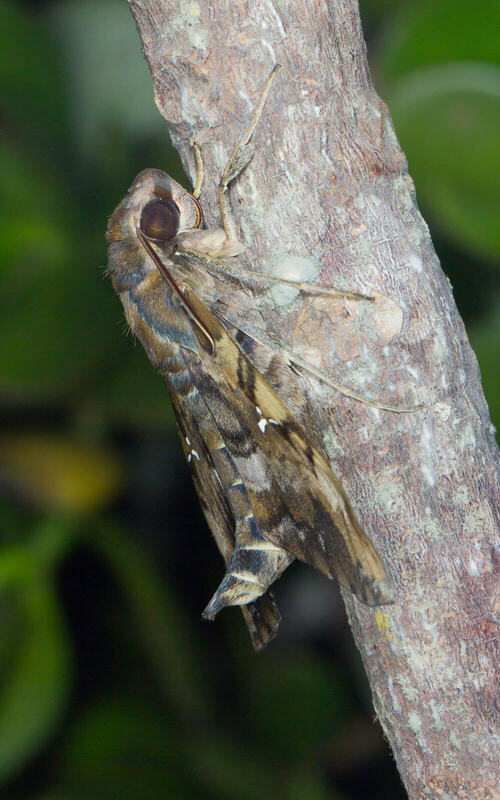 It has been known for hundreds of years that the adult Death’s-Head Hawkmoth (Acherontia atropos) can make quite a loud squeaking sound when handled. 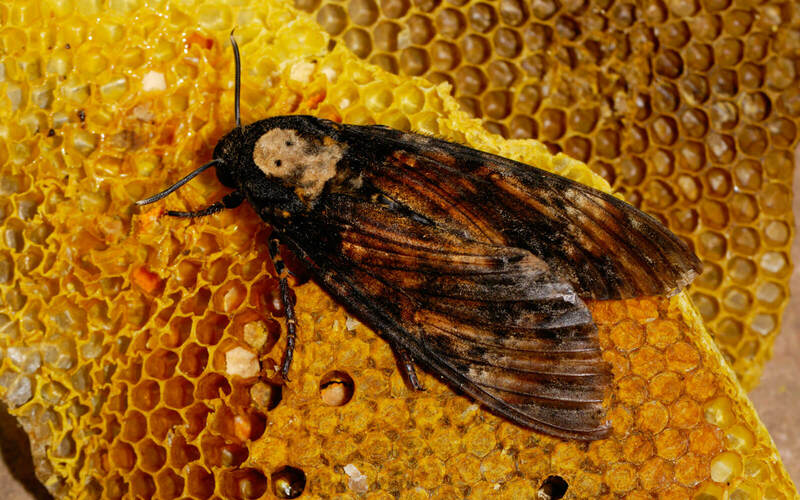 The moth is well known to raid beehives for honey, and like this one are often found by beekeepers removing hives from peoples’ roofs. There is a belief that the squeaking mimics the sound made by the queen bee to pacify her workers – but this is not borne out by science. But what about hearing? Many insect groups, such as crickets and cicadas, create sounds as well as being able to hear them. 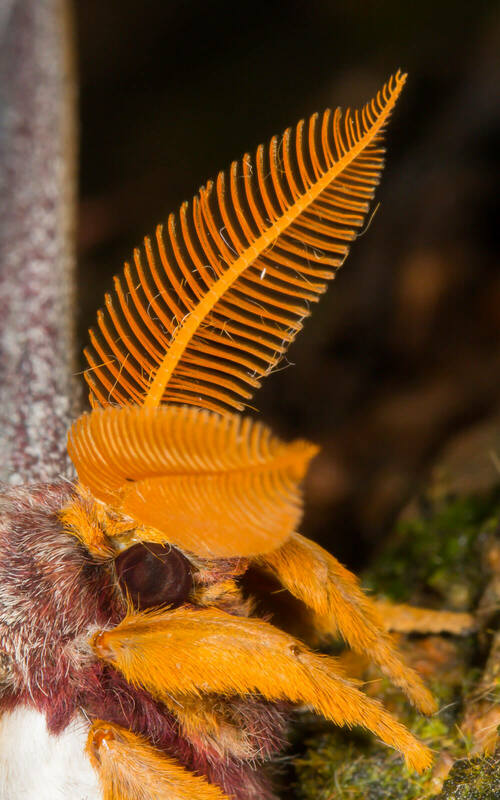 Moths are also capable of hearing, and have evolved sensitive ears on their bodies that can detect bats’ echolocation calls, allowing them to take evasive action. Geometrids like this Dimorphic Tiger (Callioratis abraxas) have rear-facing ‘tympanal organs’ on their thorax, behind the wings. This is a very old adaptation, which probably pre-dates the switch from nocturnal to diurnal flight – because diurnal species have them. The ears work like ours do, in that there is a tympanum or eardrum, which is connected to a sealed air space. This then vibrates in harmony with the incoming sound. Nerve endings in the ear detect these vibrations, and are specially sensitive to bats’ voices. Such ears have evolved in 19 separate insect groups – and there is evidence that such ears were found on insects before bats even evolved! Butterflies’ ears are different to moths in that they are tuned to low frequency vibrations. 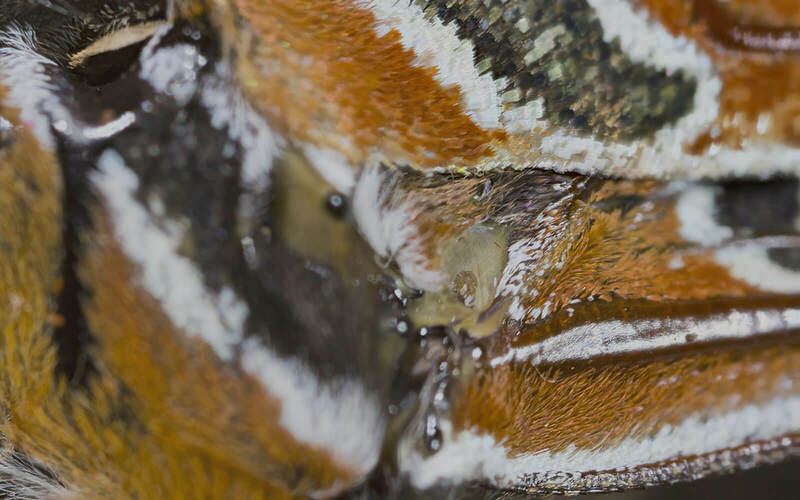 The best documented example is a South American Morpho species, but a quick inspection of photographs showed that our local Nymphalidae butterflies have similar ‘Vogel’s Organs’, as shown by this White-barred Charaxes (Charaxes brutus natalensis). The actual hearing organ is the tiny disc inside the structure, which is known as the ‘tholus’ and has one of the sensory organs attached. The leaf-like structure surrounding this presumably serves to focus the sound waves on the tholus – rather like the more familiar structures on mammals. And many Browns (Satyrinae) have swollen bases to their forewing cubital veins, which are hollow and attached to the tholus – as seen on this Dark-webbed Ringlet (Physcaeneura panda) whose swollen vein is coloured bright orange. The ear is a tiny opening at the end of the vein nearest the body. What butterflies’ ears are tuned to detect is uncertain, but the evidence is that they are as good as the best microphones. The most likely candidates are the beating of birds’ wings or their calls. Predator detection and avoidance – again. 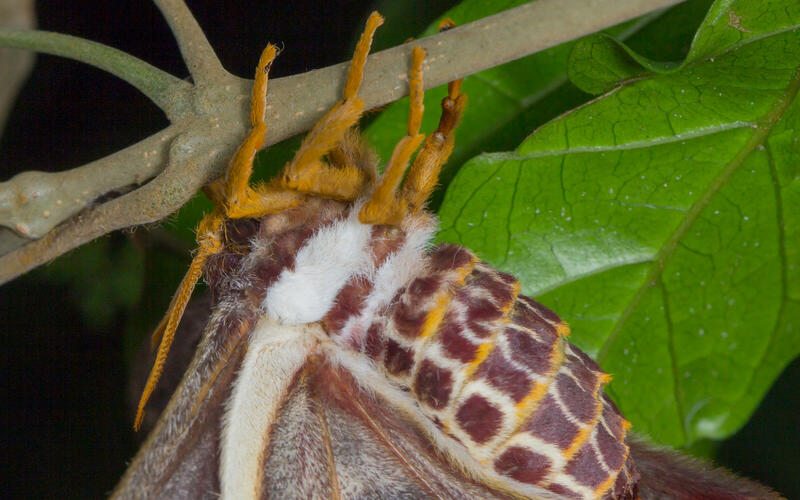 Not all moths’ ears are on their bodies. 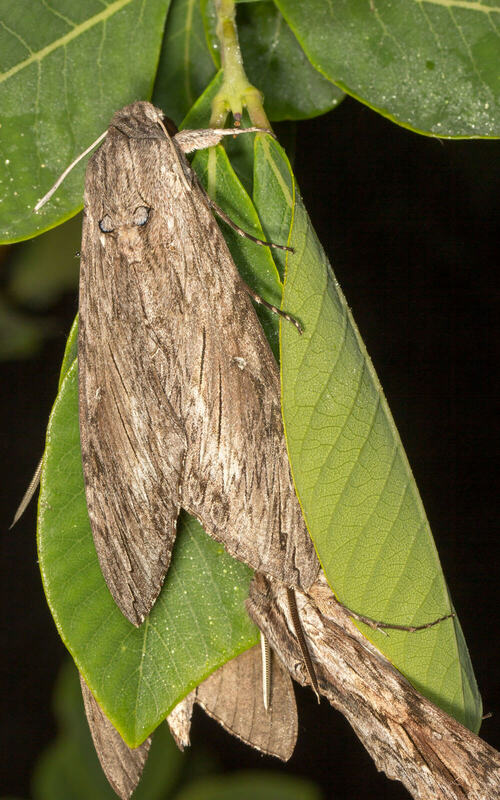 Hawkmoths’ ears are on their heads, as air sacs or scale plates on the large taste and smell organs known as palpi. These transmit the vibrations to nerves located on their proboscis. 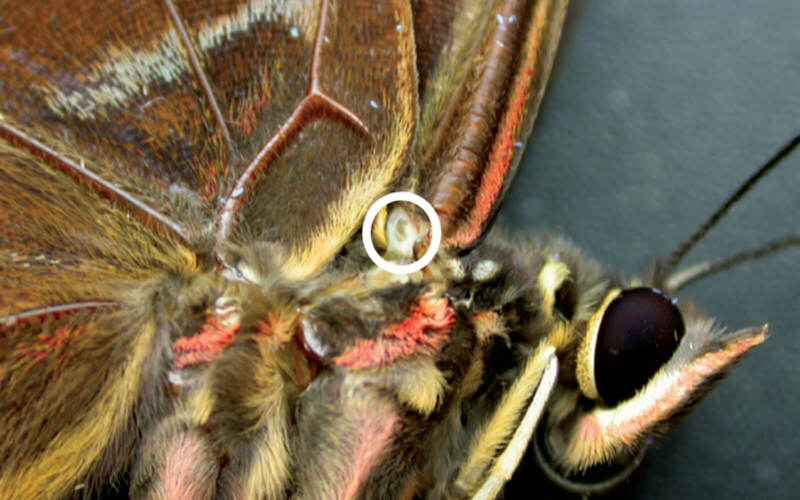 This is visible as a bulge on the ‘forehead’ of this Accented Hawkmoth (Nephele accentifera) It is also known that some species of hawkmoth, on detecting bats’ calls, produce their own ultrasonic sounds. It’s not certain from where they make these sounds. Several moth species, notably the Tiger Moths (Arctiinae) sound-producing organs inside their bodies, known as ‘timbals’. These are used to react to bats’ calls, and there is evidence that they are capable of jamming the bats’ ‘biosonar’ and even used to warn the bats that the moths are unpalatable. 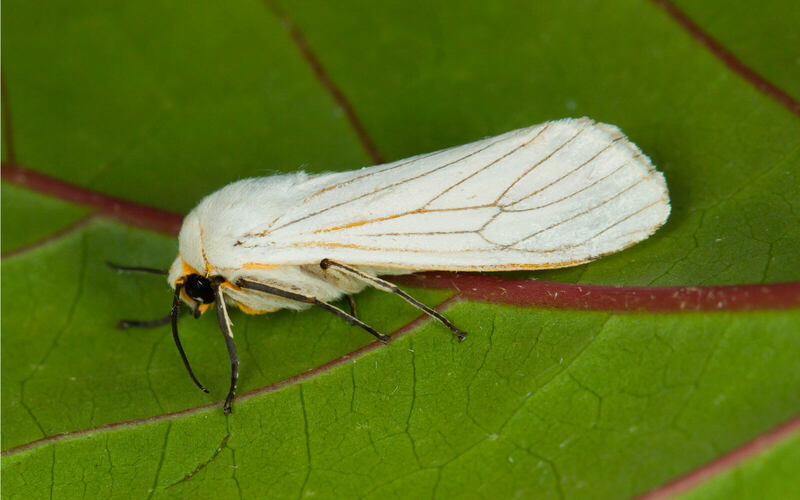 We have no confirmed records of this in African species, but the Veined Ermine (Ustjuzhania lineata) is closely related the American Grote’s Bertholdia (Bertholdia trigona). This moth has been proven not only to be able to jam and confuse bat sonar, but also to startle bats unused to prey that shouts back! Those who have seen a butterfly emerge from its chrysalis will know that these insects can sense touch. If a wing gets hung up on a twig or leaf whilst expanding and hardening, the adult may become crippled and unable to fly. 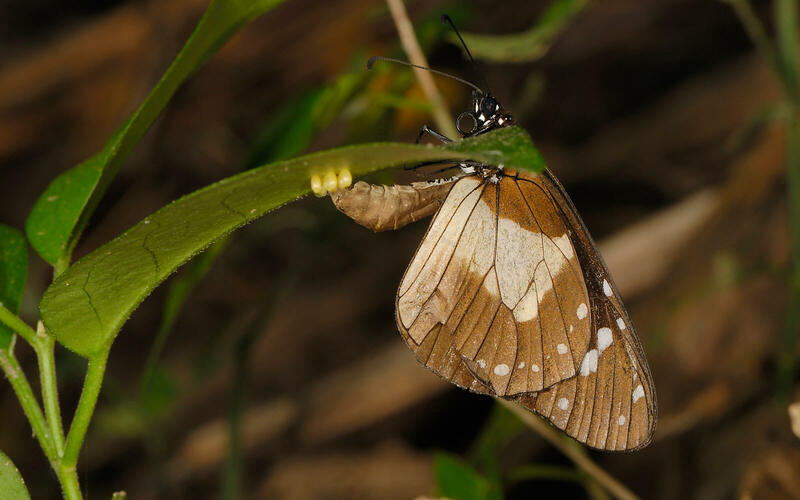 So the newly emerged butterfly, like this female African Migrant (Catopsilia florella) swivels itself slowly to and fro using its legs, feeling for its wings touching obstacles, which it moves to avoid whilst it is still soft and vulnerable. To conclude – but is there one more sense? So there we have it – vision, hearing, smell, taste and touch. What about a sixth sense? 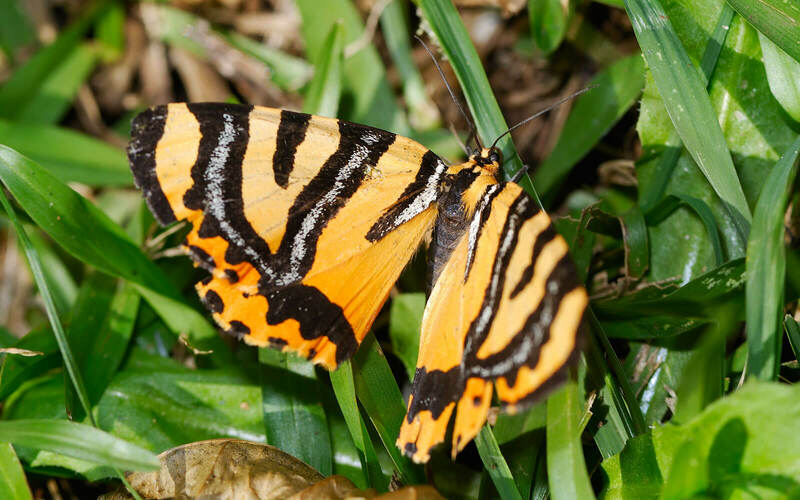 Well it turns out that at least one butterfly species has this – the migratory American Monarch, Danaus plexippus has magnetism-sensing molecules in its head. These allow it to sense the earth’s magnetic field when navigating, and to be able to keep flying in the right direction even in cloudy weather. The butterflies are short-lived. Unlike birds, which fly back and forth on their migratory path every year, butterflies’ great grandchildren make the return journey. This is instinctive, and hard wired into their nervous systems. In Africa we have some robust long distance migratory Lepidoptera. 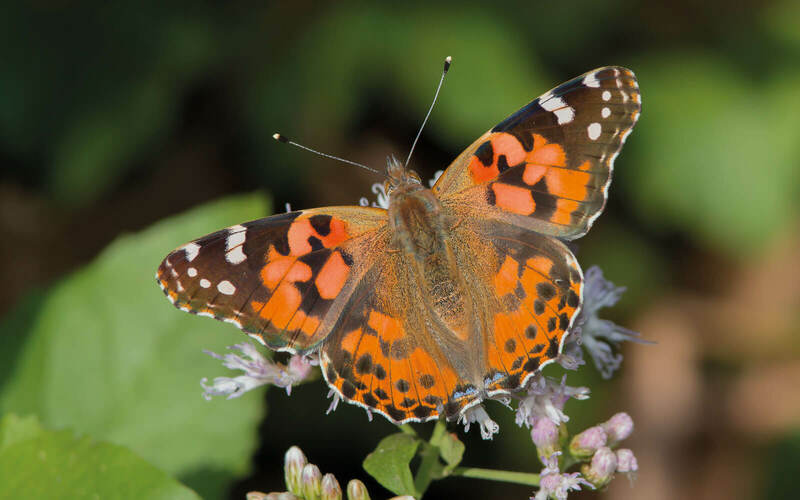 The Painted Lady (Vanessa cardui) has an even longer migratory loop than the Monarch – from Cape Town all the way to the Arctic! And the Convolvulus Hawkmoth (Agrius convolvuli, and other similar moths) migrate similar distances – at night. We may be fortunate enough to find vast numbers attracted to lights, when we can see how huge their numbers are. So although it still has to be proven, these creatures also probably have a magnetic ‘sixth sense’. Steve Woodhall is a butterfly enthusiast and photographer who began watching and collecting butterflies at an early age. He was President of the Lepidopterists’ Society of Africa for eight years, and has contributed to and authored several books, including Field Guide to Butterflies of South Africa and the popular What’s that Butterfly? 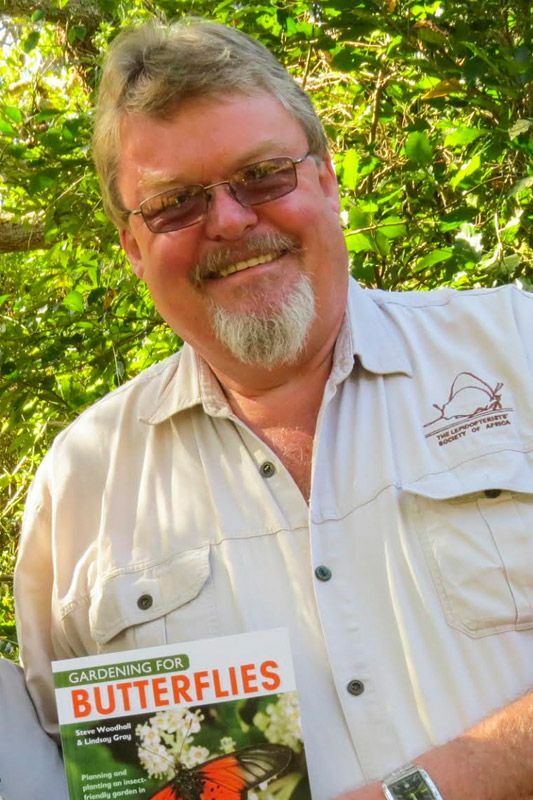 His app, Woodhall’s Butterflies of South Africa, is described as the definitive butterfly ID guide for South Africa.